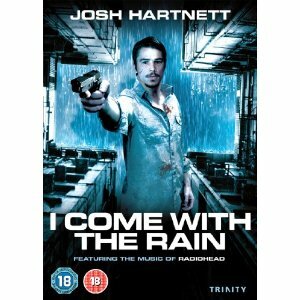 “I Come With The Rain” will not be everyone’s cup of tea. Be warned that I like strage movies and one’s that make you think and that are stylish. I watched this because I am a fan of Josh Hartnett (Lucky Number Slevin, 30 days of nights) and I also like weird and strange movies with Elias Koteas (Crash, Let Me In). Radiohead supplie the score and you know it strange when they do the Soundtrack for a movies. Will I was not disappointed because I found it quiet good. It moves along like “Lost In Translation” and “All About Lily Chou-Chou” with the Guns and violence of a Korean great like Old Boy. I liked the acting except for the Chinese/Korean actors speaking English to each other did not work at times. It is very stylish and cool through out. It’s strange, i liked it, you may not.